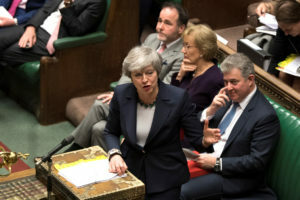 LONDON — British Prime Minister Theresa May was making a last-minute push Monday to win support for her European Union divorce deal, warning opponents that failure to approve it would mean a long — and possibly indefinite — delay to Brexit. READ MORE: UK lawmakers vote to delay Brexit. Now what? Opposition to May’s deal centers on a measure designed to ensure there is no hard border between the U.K.’s Northern Ireland and EU member Ireland after Brexit. Johnson, a staunch Brexiteer, used his column in the Daily Telegraph to argue that the backstop left the U.K. vulnerable to “an indefinite means of blackmail” by Brussels. UK lawmakers vote to delay Brexit. Now what?